Every car finish shares a common enemy. This enemy, usually invisible, is relentless in its pursuit; it surrounds us in the air we breathe and your vehicle's paint is engaged in battle with it from the time it rolls out of the factory gate. The enemy is airborne pollution and fall out. Regular washing cannot remove it and even paint polishing is highly inefficient at attacking it. The solution is Detailing Clay. Detailing Clay is perhaps one of the most innovative and effective do-it-yourself product developments in the car care industry, despite being overlooked by many detailers and enthusiasts. Invented in Japan in the late 1980s, automotive Detailing Clay is a paint cleaning system designed to safely and effectively remove bonded surface contamination that is not removed with normal car washing. Claying your paint with Detailing Clay is not a substitute for polishing your car. Claying is a process that needs to be done prior to polishing to remove contaminants that have adhered to your paint. The polishing process then removes paint defects such as scratches, swirl marks, oxidation, and staining while improving overall paint clarity to enhance gloss and prepare your paint to accept car waxes, paint sealants, or coatings. For those who have never done it, rubbing detailing clay on your car does sound a little strange, but it is actually very effective, super easy, quick, and extremely safe! If you have never clayed your paint you will quickly see what you have been missing within the first few passes. It's actually kind of fun! This step-by-step article will walk you through the process of claying to remove the bonded surface contamination and prepare your car for polishing and/or protection. Does My Car Need to be Clayed? First of all, age does not matter! Many people think that a new car does not need to be clayed. This is not necessarily true. Contamination doesn�t care if your car is new or old. If your car is subjected to airborne contamination that has bonded to the surface it needs to be clayed. Just remember, even a new car has been subjected to several environments prior to the salesman handing you the keys. 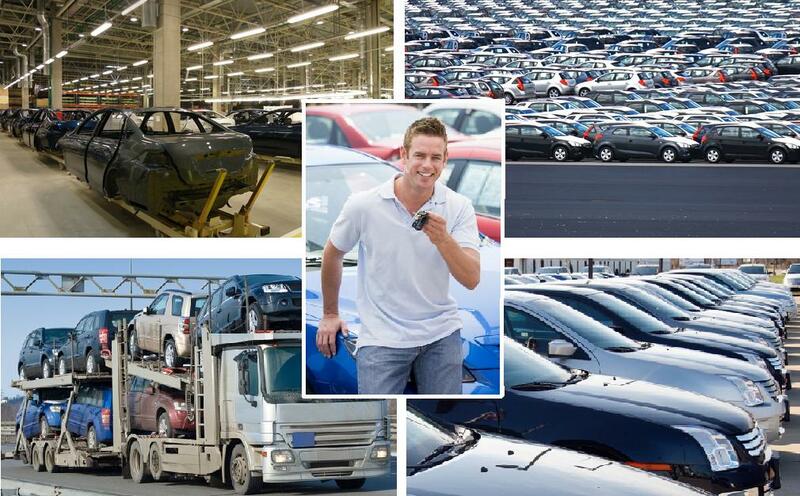 Your car started at the factory, sat on a lot waiting for transport via ship, train or truck, and then it sat on the lot waiting to be purchased. Who knows what was floating around the air on the long journey between the factory and your driveway? New or old, there is a way to tell if it is time to clay your car. The contamination that clay removes can often be felt by touch. Paint should feel smooth. If you feel a gritty, a sandy, or a pebble like texture on the paint then it needs to be clayed. Wash your car to make sure the surface is clean and free of any loose dirt, then feel the surface with the back of your hand for obvious contamination. Sometimes you can feel it right away but you may need to go one step further with your contamination test. 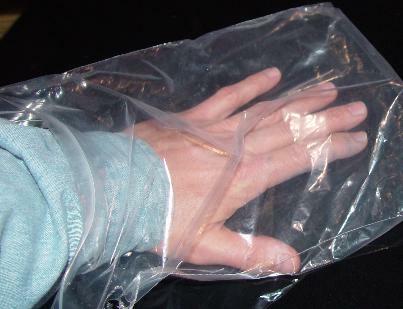 Take a plastic baggie and place your hand inside the bag. Do you feel the difference? The plastic bag basically amplifies the surface contamination bonded to your car. Even if you don�t feel much, it is best to remove it before moving on to your polishing and protecting processes. Bonded surface contaminants make your paint feel rough leaving your paint more prone to oxidation and premature aging. If your paint is not slick and smooth, dirt and grime tend to stick to the surface of your car, which can lead to instilling that dreaded swirl during your car wash process. Many other contaminants that float around the air and attach themselves to your paint�s surface. Surface contamination, as shown by this magnified illustration, won�t budge when you wash the surface using a traditional wash method. The contamination is even difficult to polish off. Detailing Clay will quickly and easily remove this contamination as it glides across your paint surface without damaging your paint. Detailing Clay works by gliding over the surface of your paint on a thin layer of clay lubricant. The contamination sticks up through the surface of the paint where the clay is able to remove it. 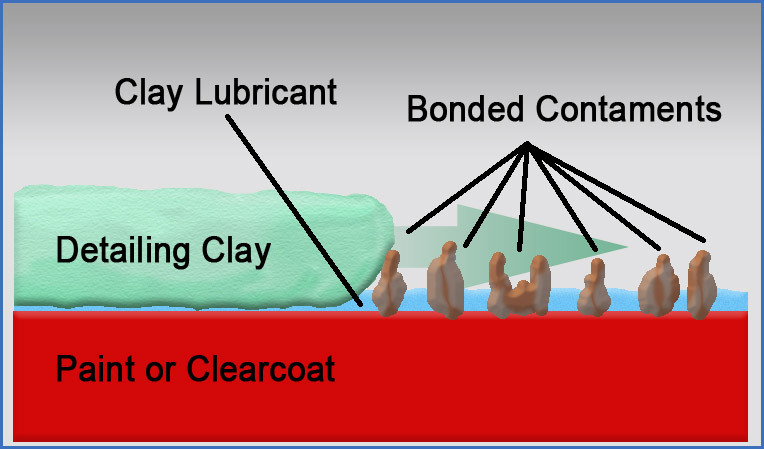 The clay lubricant helps to keep the clay from sticking to the surface of the paint while it removes the bonded contamination. Although detailing clay is abrasive, it will not harm paint as it is only abrasive to the contamination. The Detailing Clay actually shears the bonded surface contamination without harming your paint. There are many brands of clay with different levels of aggressiveness. Aggressive Detailing Clays are typically used in body shops to remove difficult contaminants like heavy paint overspray. Ultra-fine to medium grade Detailing Clays are formulated for professional detailers, serious enthusiasts and average consumers. Meguiar's Professional Detailing Clay is an aggressive detailing clay that will quickly cut through heavy contamination. However the abrasives in this synthetic bar are aggressive enough to lightly mark or scratch the paint, requiring some machine paint polishing to remove. This bar is recommended for professionals or serious enthusiasts who have machine paint polishing experience. BLACKFIRE PolyClay II is a medium grade of synthetic clay that is gentle to paint but tough on paint contamination. This is a consumer grade clay that many professionals use for its quick cleaning action. Pinnacle Ultra Poly Clay is an extremely fine clay that will remove light contamination quickly with almost no risk of damaging even the softest paints. This fine clay is well suited for regular use and is so gentle that it will not remove most waxes and paint sealants. The Cobra Clay Mitt is a new take on the clay bar. The Cobra Clay Mitt replaces a claybar with it's polymerized rubber surface. This special surface allows the mitt to remove contamination just like a clay bar, while saving both time and money by allowing the mitt to be rinsed and re-used dozens of times. Without proper lubrication Detailing Clay simply will not work. Instead, the clay will stick or skip across the paint and likely cause marring. Lubrication with a detail spray or proper clay lubricant, like BLACKFIRE Clay Lubricant, Pinnacle Clay Lubricant , or Meguiar's M34 Final Inspection will help the Detailing Clay to properly glide across the paint surface. IMPORTANT! If you drop your detail clay bar on the ground you MUST throw it away as it will pick up dirt from the ground that will scratch your car! Always work in a shaded area and on a cool surface. Claying your car on a warm or hot surface will tend to make the clay stick to the surface and will not be effective to remove the bonded surface contamination. Thoroughly wash and dry your car or truck. Cut your Detailing Clay in half or quarters and form a round flat wafer. A 200g Detailing Clay Bar will make four pieces. Spray your detail clay lubricant onto approximately a 2� by 2� area. Using light pressure, glide the detailing clay bar over the surface of the paint in a back and forth motion. Do not apply excessive pressure; remember you are only hydroplaning over the surface to remove bonded contaminants. The clay may tend to grab at first, then you will feel it break free and easily glide back and forth as the contaminants are removed. IMPORTANT! Keep your clay and the surface well lubricated with your detailing clay lubricant. Wipe clay lubricant from the surface with a quality microfiber towel such as a 530 Supreme. Fold over your clay and knead to reshape often to expose a clean clay surface. Feel the area that has been clayed. It should feel slick and smooth. If not, you will need to repeat the process until all of the surface contamination has been removed. Continue this process over the entire car. Remember that detail clay works great on glass, chrome and wheels too. Heavy embedded contaminants on wheels will probably require lots of elbow grease! As a precaution when claying wheels - be sure to use a dedicated clay bar that will never be used on your car�s paint. As your Detailing Clay Bar works by lightly abrading and removing contamination, it becomes contaminated itself and a fine gray or brown film will begin to cover the surface of the clay. Traditionally, the contaminated side is folded onto itself to expose a clean side. While this works well and you can get considerable life from your Detailing Clay, the question remains: what just happened to the contamination that was pressed into the center of the clay? Over time, the contamination will become so heavy that the clay bar will lose its ability to work and can cause scratching. BLACKFIRE Clay Cleaner & Extender is a formula designed to clean the contamination from the surface of the clay without drying it out or damaging it. Mist a couple of squirts of this cleaner on the contaminated side, massage into the clay with your thumbs, and rinse off; the contamination will rinse away. Now you can fold clean clay onto itself - preventing the main causes of clay losing effectiveness. Storage: Be sure to spritz your detail clay bar with your clay lubricant to keep it from sticking. Store it in its original box or in a re-sealable plastic bag. Do not let your detail clay freeze or reach temperatures above 120 degrees. Meguiar's highest rated detail spray!